This integration enables brands to see and create Sugar Contact, Lead, Account and Opportunity record data right from within LiveEngage. It will also allow you to view your LiveEngage transcripts from within Sugar CRM. Brands that use LiveEngage for sales and support can offer a more personalized, informed experience with access to SugarCRM, by giving agents a full overview of the account, including previous or existing cases, opportunities and even potential leads. Click here for the SugarCRM Widget Integration Guide! Brands that use LiveEngage for sales and support can offer a more personalized, informed experience with access to SugarCRM, by giving agents a full overview of the account, including previous or existing cases, opportunities and even potential leads. 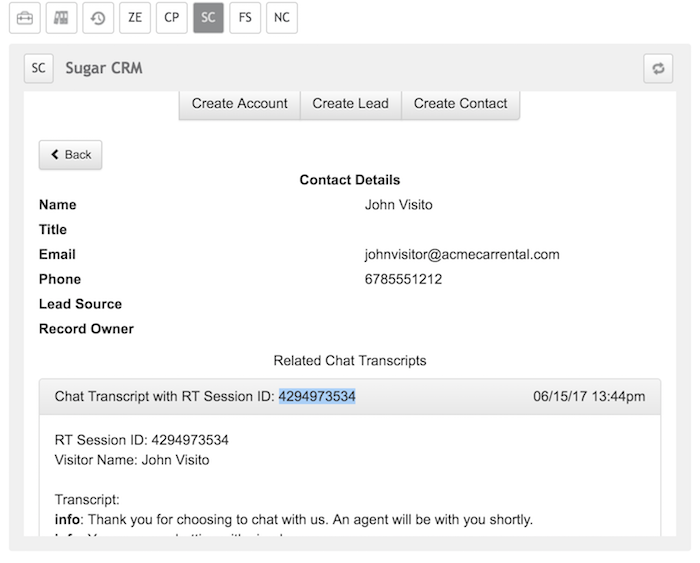 Through the LiveEngage Sugar CRM integration, agents can utilize the workspace to conduct all conversations with customers, and get instant access to pertinent information without having to open a separate browser window to manually check the SugarCRM record. Agents can also search through records using the field from pre-chat surveys and/or through the widget. Furthermore, agents have the ability to easily create records in SugarCRM as part of the conversation (leads, opportunities, accounts, cases) and store the conversation transcript and additional info in the CRM after the engagement.